Front-Groups representing corporate (drug testing labs, EAPs, inpatient treatment industry) and political (prohibitionist, war on drugs, AA 12-step paradigm of addiction) interests. 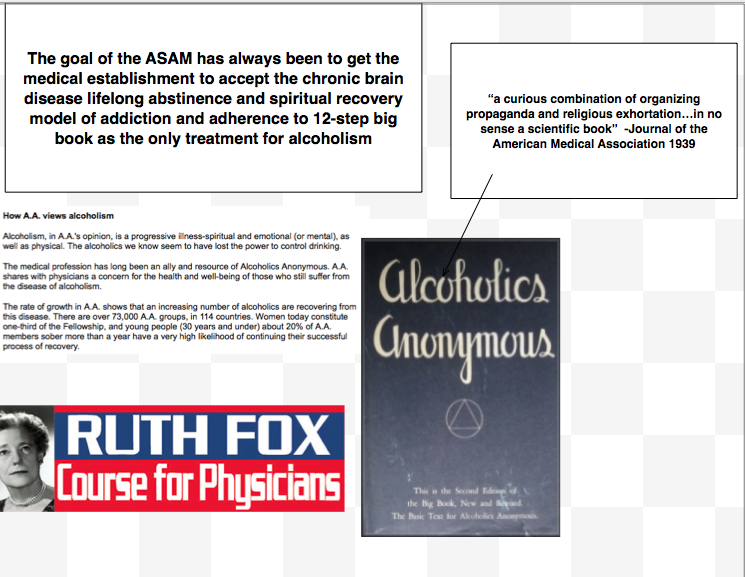 American Society of Addiction Medicine ( http://www.asam.org ) –ASAM primarily a lobbying group/special interest group. 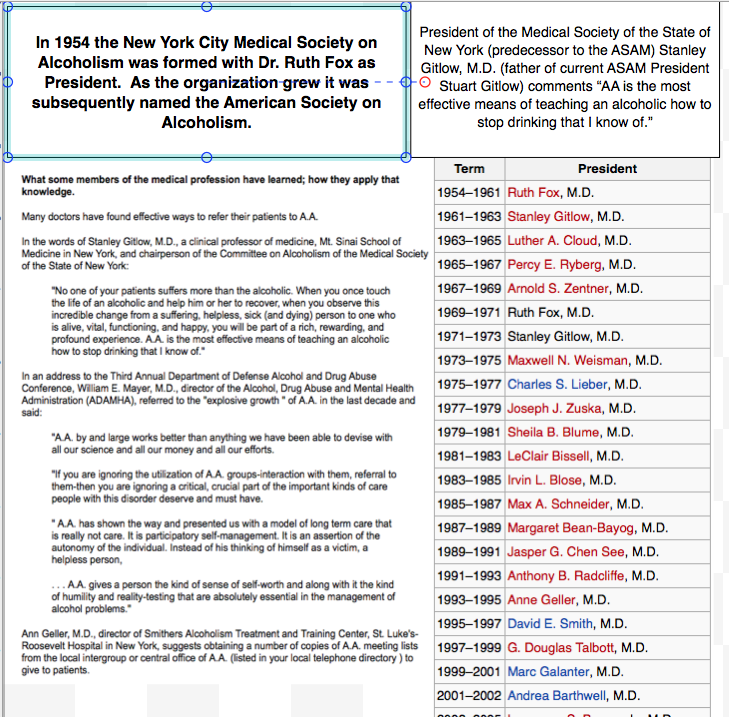 Origins can be directly traced to Alcoholics Anonymous (A.A.) and started by Dr. Ruth Fox. Goal originally to get the medical establishment to accept the chronic brain disease model and 12-step spirituality as the only treatment for alcoholism. 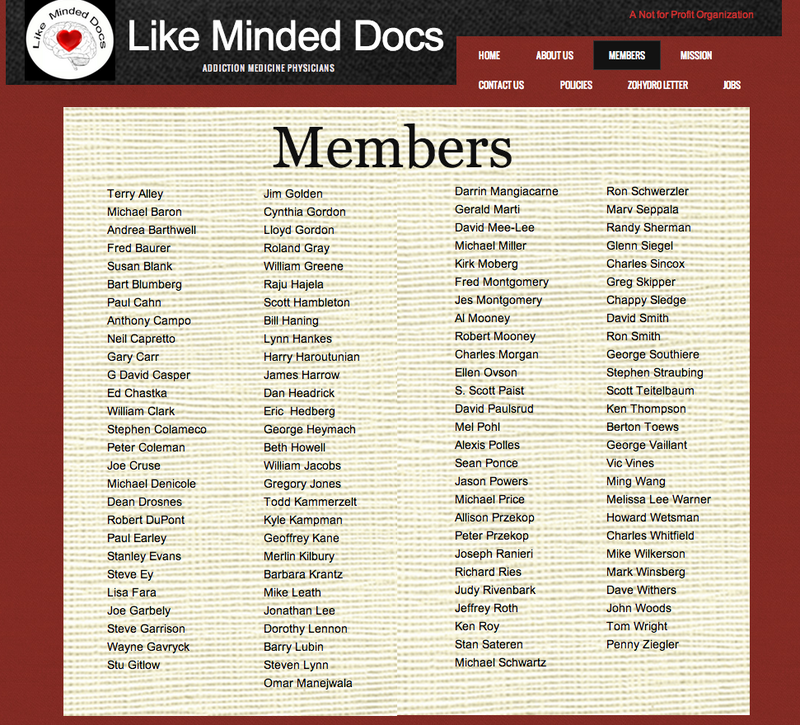 Like Minded Docs (http://www.likemindeddocs.com/about-us.html )–a right wing conservative subset of ASAM. 12-step ideology and facilitation primary goals. 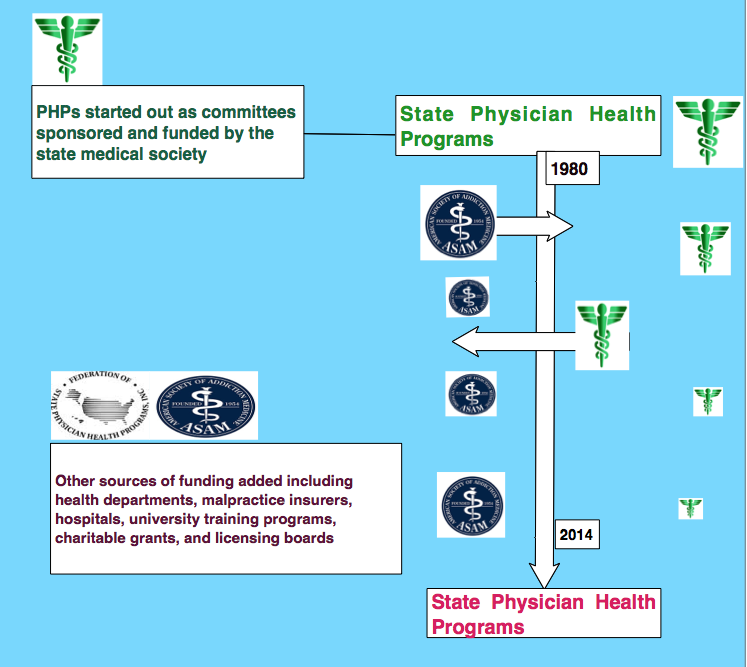 Physician Health Programs and Professional Health Programs (PHPs)–started in the 1970s as “impaired physician” programs and existed in every state by 1980. Changed to Physician Health Programs (PHPs) to focus on wellness rather than impairment. Organizational goal to help sick doctors and protect the public and originally funded by medical societies and staffed by volunteer physicians. Now taken over by ASAM doctors. 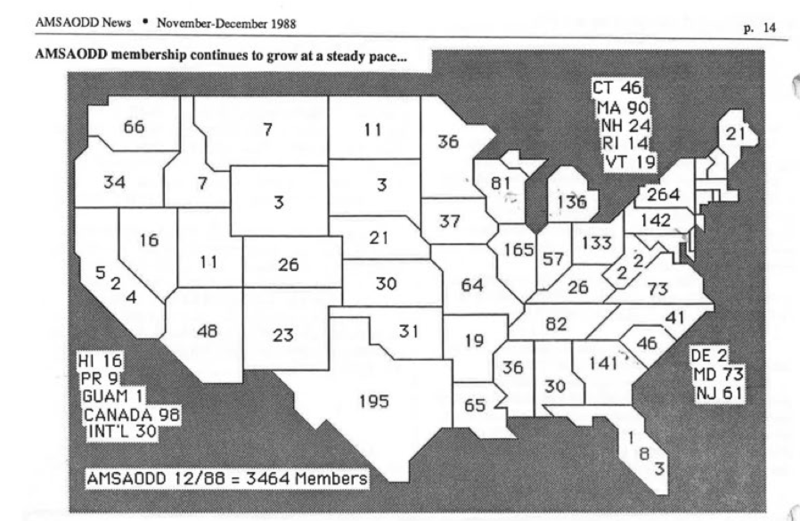 Map below shows number of ASAM certified physicians by State in 1988 (ASAM then known as AMSAODD). 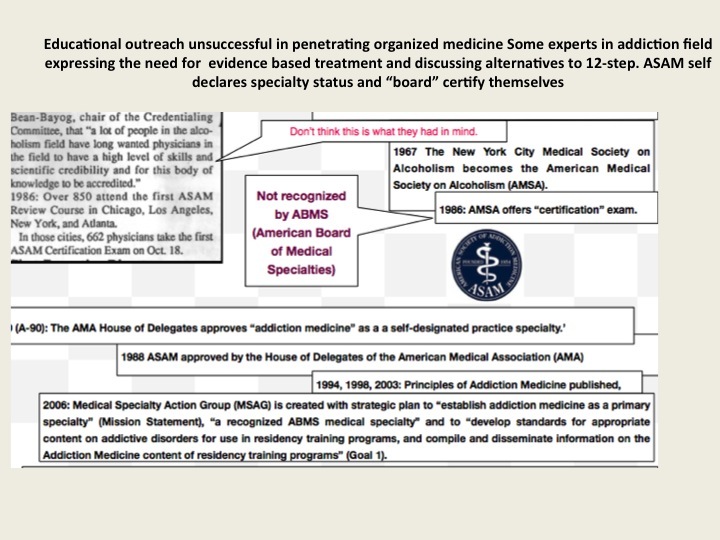 ASAM/ABAM “Board Certification” not recognized by American Board of Medical Specialties. Group of physicians “in recovery” In 1986 started calling themselves “experts” in addiction medicine. Addiction Psychiatry only recognized subspecialty in addiction medicine and requires 4 year psychiatry residency and 1 year of fellowship at an accredited training program and stringent testing and oversight. ABAM certification requires only an MD and board certification in ANY specialty. ABAM certification = Diploma Mill. Started in 1986. 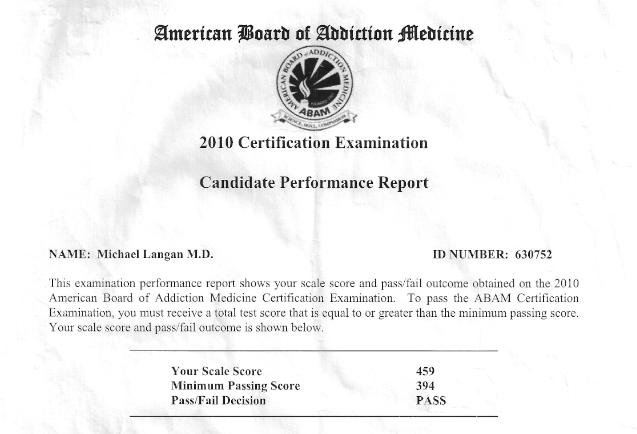 I took exam in 2010 to make this point and passed by 65 points with a score of 459 (Passing = 394). Purpose of Diploma Mill = Profiteering from multi-billion dollar treatment industry now dominated by the “Minnesota Model” (i.e. addiction is a chronic “brain-disease,” complete abstinence, life-long spiritual recovery (AA, 12-step). “PHP-approved” assessment and treatment centers. State PHPs and the FSPHP mandate that any assessment and treatment be done at a “PHP-approved” assessment and treatment center and exclude non-PHP approved assessment and treatment centers. No criteria or list of “PHP-approved” assessment and treatment centers. None exist. All of the “PHP-approved” facilities can be correlated with list of Like-Minded Docs. 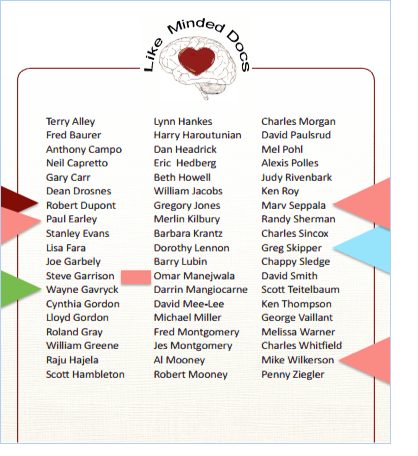 LMDs are medical directors of all “PHP-approved” assessment and treatment centers. 2. Establishment Clause violations –doctors being mandated to 12-step facilities only. Who are they? The majority of these physicians are “recovered” addicts and alcoholics who had licenses revoked. They were able to regain their licenses by convincing State Medical Boards that they were 1) Recovered, reformed, redeemed. 2) Societal need for addiction medicine doctors. Convinced boards that if their licenses were restored they would altruistically dedicate their lives to helping other addicts and alcoholics. Win-win situation. 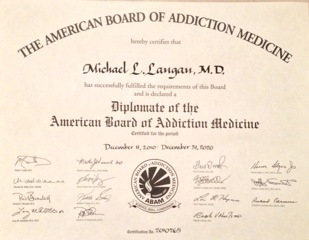 Licenses restored they then became “certified” in addiction medicine. Where did they go? 1) Joined PHP programs funded by State Medical Societies and staffed by volunteer physicians. 2). Staffed 12-step inpatient drug rehabilitation programs as Medical Directors. The State PHPs were “sitting ducks.” The equivalent of other employee EAPs but without protection (i.e. 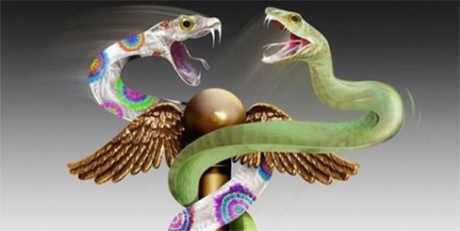 no union or worker organization set up to protect a doctors interests) No oversight, regulation, inspection, or transparency but layers of procedural protection). They systematically and slowly took over the PHPs in each State and now monopolize the system. Physicians who did not go along with the “groupthink” were removed over time. In Massachusetts the coup was accomplished when Dr. John Knight, M.D. was removed in 2009 and Dr. J. Wesley Boyd, M.D, PhD was removed in 2010. Physicians removed from PHPs were threatened with swift and certain consequences if they violated confidentiality agreements or “peer review” protection. “Win or lose, you’ll lose everything. Most effective, however, was the implied and unspoken threat that if they did not do as they asked they could end up being monitored by them. (having been witness to ethical violations and criminal activity committed with impunity the message was heard loud and clear. 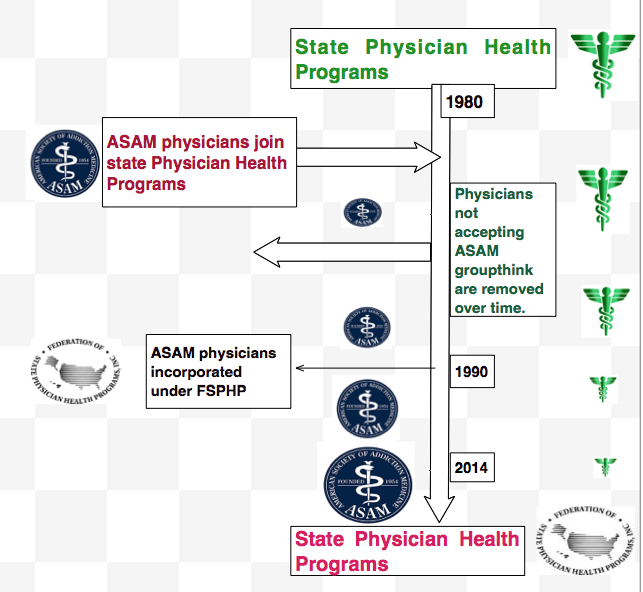 The State PHPs taken over by the ASAM physicians are under the umbrella organization FSPHP. PHS formally entered into this partnership in 2013. 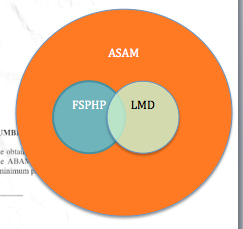 The ASAM staffed treatment centers are also under an umbrella organization. In reviewing my records please note that every person involved in my “assessment” and “treatment.” Has been a Like-Minded Doc including the Medical Review Officer at PHS, Wayne Gavryck, a former alcoholic and graduate of the program with a history of malpractice and no qualifications. (in contrast to Knight and Boyd he has no publications, teaching, or academic affiliations. He is also the person at PHS who should have thrown out the PEth test. Primary purpose = Profit and monopoly. Who profits? 2). The drug testing companies. How does it work? 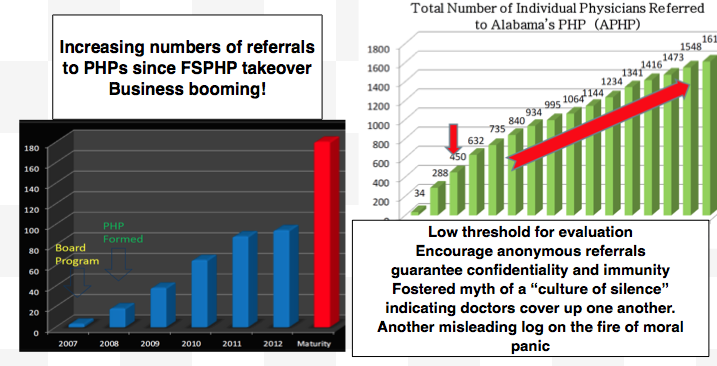 Like-Minded Docs is to the ASAM what the Tea-Party is to the GOP and the FSPHP are the brown-shirts of the group. Step 2) Refer for an evaluation at a facility experienced in the diagnosis and treatment of health care professionals (Hazelden, Bradford, Talbott,). Hearing same pattern across the country. Neuropsychological assessment fraud with diagnosis of “denial” based on elevated L-score on MMPI and “cognitive impairment” based on shaving off executive function points on the Wechsler IQ scale. Deem unable to practice medicine and recommend 1-4 month inpatient rehabilitation. Step 3) “noncompliance” default. 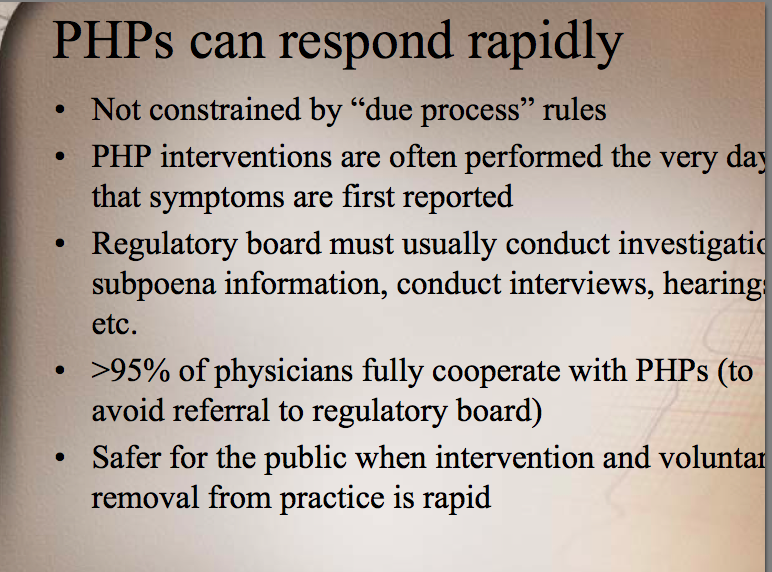 With PHS programs the “trump card” is to call the monitored physician “noncompliant” and report it to the board. Wayne Gavryck, MD. Medical Review Officer for PHS, Inc. Reported PEth test as positive July 19th, 2011. Based on the positive PEth recommended an evaluation at a facility experienced in the “evaluation and treatment of health care professionals.” Given 3 choices. Hazelden—Medical Director Omar Manajwela in 2011, and now Marv Seppala. Have documentation confirming collusion with Talbott Rehabilitation Center to commit fraud (2008) . Had evaluation in 2008 under Paul Earley.-Fabricated MMPI. Documented by oversight Board. I chose Hazelden.. Dr. Omar Manajwela did not find any history of alcohol abuse (past or present) and I was not admitted for treatment. He could not explain the positive PEth test, however, so recommended AA meetings. I informed Hazelden I had requested the “litigation packet” as I suspected fraud and was told they could revise my discharge summary if I was able to prove this. Linda Bresnahan then requested I verify attendance at AA meetings by giving them phone numbers of anonymous attendees and said that it was the recommendation of Hazelden. Made multiple requests to Dr. Omar Manajwela to verify that 1) he did not recommend this , and 2) that it was inappropriate. He refused. I obtained the “litigation pack” that showed forensic fraud. Documents show collusion with labs to both produce the positive test (USDTL, Fax from PHS, inc. to USDTL requesting a chain of custody be added to an already positive test) and cover-up (Quest diagnostics). Confirmed fraud after investigation by The College of American Pathologists). CAP forced USDTL to change PEth from “positive” to “invalid.” This was done 10/4/2012. I contacted Hazelden multiple times and sent them the litigation packet showing misconduct and asked that they revise my record and recommendations. Dr. Marv Seppala,Medical, Director of Hazelden, acknowledged the test was invalid but refused to make any changes in my records or help me convey this to the BORM. PHS called me “noncompliant” 10/8/2012. PHS barred me from using my asthma medication. With a history of severe asthma since childhood, it had been under control for 10 years. Had multiple cold induced asthma attacks documented by Dr. Bierer. Had to stop exercising at gym I had been going to almost every day for years. After suffering a cracked molar I was told it would require partial sedation by orthodontist. Told Dr. Chinman who told me they would test my hair and if they found anything “that would be it”. Left untreated 9 months. I chewed on one side of my mouth and tolerated the pain. They also tried to financially torture me. Multiple excessive charges billed by PHS with demand that I pay or they would report me to the BORM for noncompliance. These are tests that were not even done and an audit of PHS would reveal them to be false. I told Dr. Chinman I was having financial difficulties because of what was occurring but that I had put . $2000.00 away for Christmas presents. The next day Linda Bresnahan demanded $2000.0 under threat of reporting me to the Board. I requested a day off from testing because my daughters were dancing in Providence in the Irish Step dancing finals (Oireachtas) and would not be available that day. The day before the Oireachtas he called me and told me he had to change our monthly appointment and the only time he could see me was the next day, it was mandatory, and if I did not he would report me to the BORM. The appointment was the exact same time my daughters were dancing. He looked it up. Robert Dupont – Former White House Drug Czar (1973 to 1977) and the Director of the National Institute on Drug Abuse(NIDA) (1973-1978). Fellow of the American Society of Addiction Medicine. Founding President of the Institute for Behavior and Health, Inc. He and Peter B. Bensinger (former DEA administrator) founded Bensinger, Dupont, & Associates, a national consulting firm that specializes in workplace drug testing(EAP). ( http://bit.ly/1nNjWzi ).